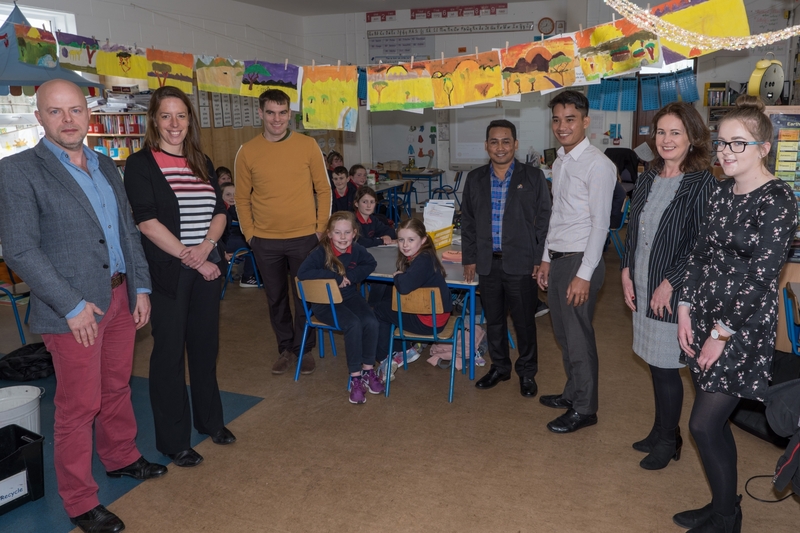 Scoil Mhuire in Staplestown last Wednesday, April 3, hosted a visiting delegation of educators from Cambodia. The group was in Ireland to learn about the Irish education system, as the country tries to rebuild its own system of teaching in the wake of the murderous Pol Pot and Khmer Rouge regime in the 1970s. Most of the country’s teachers were killed during this time, and decades later the country’s education system is still in disarray, with untrained teachers, especially in rural areas. As part of the CambodiaIreland exchange programme, Phan Sophen, technical education manager, and Chhout Sovoeun, project manager of SeeBeyondBorders visited educational institutions in Ireland. They were interested in visiting a rural school, as most of Cambodia’s schools are in rural areas, and Staplestown was selected to host the visit. “Scoil Naomh Mhuire NS is a small rural school with multi-grade classes,” said its principal Mary McDowell. “The high quality of our child-centred approach to teaching and learning has been commended by the Department of Education & Skills. We take an active, discovery-based approach to learning, using the most up-to-date practices. The visiting group talked to teachers about the methodologies they use in the classroom. They also visited classrooms to see the Irish youngsters learning, and how they engage with their education; and conversed with the Staplestown teachers. In return, said Ms McDowell, the Staplestown students got to enhance their understanding of global social justice issues through talking to the visitors. Philip Donnelly EWO; Sarah Reynolds UK Country Manager, and Colm Byrne of ‘SeeBeyondBorders’; visiting teachers from Cambodia, Sophen Phan and Sovoeun Chhout; with Mary McDowel Principal, teacher Louise Fitzgerald, and some of the pupils from 3rd and 4th class, Staplestown National School, pictured during the visit to the school, Wednesday, April 3. Photo Tony Keane.